Come join us at the Todd Library and see how history has become “Her Story” with the many told and untold lives of women. 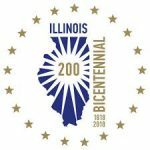 As of December 3,1818, Illinois became the 21st State in the Union. Come join us at the Todd Library and learn a little more about it’s history and fun places to visit. Aliens, Bigfoot, Vampires, OH MY! During the month of October, come visit the Todd Library and check out our book display on UFO Aliens, Ghosts, Bigfoot, Vampires, the Loch Ness Monster and much more. Take our brief survey and have some fun.